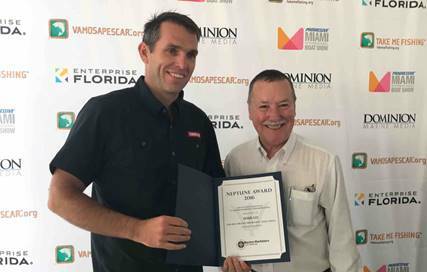 A leader in the design and manufacture of world-class marine navigation, autopilot, radar, communications and fishfinding systems, Simrad Yachting announced today the Marine Marketers of America (MMA) has selected the Simrad Go With Confidence video campaign as the Neptune Award winner for the Best Video Campaign of 2016. The Marine Marketers of America is an organization that celebrates and rewards outstanding marketing communication efforts in the marine industry. A panel of 30 judges from the marine industry selected the Simrad video campaign from 99 entries. The award was presented today at the Miami International Boat Show NMMA Industry breakfast. For more information about Simrad Yachting marine electronics visit www.simrad-yachting.com.